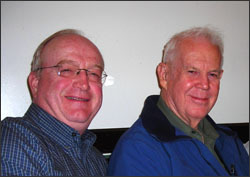 Landsat 7 Project Scientist Darrel Williams with early Landsat engineer, Art Chapman in San Francisco during the 2007 Fall AGU meeting. At the 2007 annual fall AGU meeting in San Francisco, Landsat was featured in 88 different scientific talks and posters. The subject matter included: glacier assessments, volcano monitoring, carbon trending, land use change, heat island effects and more.